Whilst Voltaire observed that ‘lightness and fickleness shaped the character of that agreeable nation’ (none other than France), Caraccioli remarked that ‘for a long time, French people have been accused of lightness, and for a long time they have not cared to mend their ways’. If lightness became such a crucial national issue in eighteenth-century France, it is in great part because of its connection with ‘civic virtues’ which were then thought to depend upon this inconstancy. The French nation would be too fickle to be seriously evil. However, the alleged lightness of the ‘siècle’ was far from inspiring unanimous praise. Many would rather condemn the inconsequential spirit of the times. Lightness thus emerged from all these discussions as one of the paradigms around or against which the entire century was defining itself. Furthermore, this interest for the question of lightness did not concern debates on morals alone, but reappeared instead in all fields of human knowledge. Whereas ‘amateurs’ or art critics extolled the ‘lightness’ of certain paintings, scientists investigated lightness as a potential property of matter. And, at the end of this Age of Lightness, the Montgolfier brothers’ balloons and others aerostats could be seen floating weightlessly over enchanted and enthusiastic crowds. The lightest century is also the one who first lifted itself to the sky. Significantly, from the Revolution of 1789 onwards, subsequent periods would also define themselves in relation to this paradigm, thereby resuming the construction of the French eighteenth century not just as the Age of Enlightenment, but instead as the Age of Lightness. From the bourgeois nineteenth century nostalgically dreaming of bygone fêtes galantes to our own early twenty first century celebrating the frivolity (and marketability) of Marie-Antoinette’s and Fragonard’s images, the last century of the Ancien Régime has never ceased to exert its charms upon the public. Now more than ever, the fascinated focus of scholars, novelists, filmmakers and artists has brought to the fore that particular aspect of eighteenth-century France: the delightfully hedonistic, fickle, witty and frivolous siècle des Lumières that they give us to see spurs the ever-expanding diffusion of this representation of history. Thus the lightness of the French eighteenth century not only appears to be the object of a multi-faceted conquest (at once scientific, moral, aesthetic, …); it also imposes itself as an historically constructed paradigm giving rise to many questions that we propose to explore from a critical and historiographical point of view during a study-day to be held at the Maison française d’Oxford on May, 15 2015. In literature, the rise of the ‘French’ novel is inseparable from this notion of lightness. The authors’ opposition to the gravitas of the Ancients conceptualised lightness in style as a way to comply with contemporary literary aesthetics whilst exploring new expressive possibilities. Besides, the novel itself was accused of being a dangerously idle genre. French literature was for instance trifling with characters who, from hedonists to immaterial sylphs to featherbrained ladies, were defined by their lightness. In contemporary memoirs and correspondences, observations of and reflections on the so-called lightness of the French nation abound. What inspired such remarks? To what extent did they craft the posterity of the eighteenth century as the age of lightness? In the domain of moral philosophy, numerous essays were written on frivolity, happiness, pleasure, whilst philosophy itself, aiming both to teach and to please, was channelled through entertaining and superficially light fables and tales. 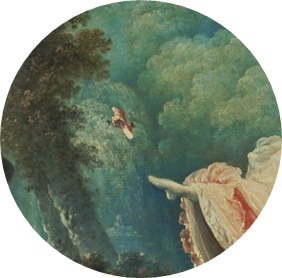 In visual arts and the arising art criticism, lightness is a quality of the painter’s style as well as the subject of the composition, as epitomised by Watteau’s ‘fêtes galantes’, Chardin’s La Bulle de savon, Fragonard’s L’Escarpolette, or Greuze’s L’Oiseau mort. Such works have often been regarded (especially in the nineteenth century but also already in their own time) as artefacts of the Lumières’ moral lightness. In architecture, lightness is defined as ‘the scarcity of material’ (Encyclopédie) and the openness of structures. How have these qualities been interpreted relatively to different architectural styles such as the baroque, the gothic, the rococo or Neoclassicism. In music, to what extent does lightness characterizes the French style? What part did the notion of lightness play in the Querelle des Bouffons for instance? In the history of sciences, from the field of medicine (through the theories on vapours) to the Montgolfier brothers, lightness (or air) appears as a crucial element to know and to master. The conquest of the sky and its representations is of particular interest to the present reflection. Finally, to promote a critical/historiographical approach of these reflections, we will also welcome papers addressing more specifically the synchronic and diachronic representations of this alleged lightness. How did other nations and subsequent periods construct themselves through their conceptualisation of the French eighteenth century as ‘light’? What can discourses on the French eighteenth century’s alleged lightness disclose about the place and time which produce these discourses? This entry was posted in Call for Papers, Opportunities. Bookmark the permalink.